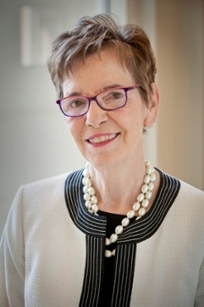 Internationally-renowned midwifery faculty Maureen Kelley, PhD CNM FACNM, will retire in December after a distinguished 36-year career in maternal and newborn health at the Nell Hodgson Woodruff School of Nursing and Emory Healthcare. A Certified nurse-midwife, Dr. Kelley’s pioneering work has advanced midwifery research, scholarship and practice at Emory and around to world. Most recently, Kelley served as co-investigator for the Maternal and Newborn Health in Ethiopia Project, a three-year program funded by an $8.1 million grant from the Bill & Melinda Gates Foundation. She was a faculty investigator on the Pregnancy Health Among Florida Farm Workers project, where she studied the impact of environmental contaminants on female farm workers. She served as principal investigator of a $3.8 million grant from the Centers for Disease Control and Prevention, which helps 20 African countries strengthen nursing regulations to ensure safe and sustainable nurse-initiated and nurse-managed HIV treatment. Kelley joined the School of Nursing faculty in 1980 and was the first nurse midwife to serve at Emory Crawford Long Hospital, now Emory Midtown. She served as chair of the Department of Family and Community Nursing at the Nell Hodgson Woodruff School of Nursing, and director of the nurse midwifery program at Crawford Long Hospital. As director of Crawford Long’s nurse-midwifery program, she established the Centering Pregnancy program, a groundbreaking prenatal health program that provided group prenatal care. Bringing together up to 10 women (and often their partners), the midwife-facilitated sessions provided health assessments, education and support for women and families. She worked to expand preparation of family-nurse midwives in mental health and substance abuse and to develop a pediatric critical care specialty to meet the growing need for this type of care. Kelley also worked to strengthen the workforce of nurse midwives internationally to improve health outcomes for vulnerable populations worldwide. She worked in collaboration with the Lillian Carter Center for Global Health and Social Responsibility, the Caribbean Regional Nursing Body and with the chief nursing officers of individual countries to strengthen nurse-midwifery throughout the Caribbean. She helped the Caribbean Community and Common Market (CARICOM) medical team create cultural and academic exchange programs between Emory and several Caribbean countries for midwifery and advanced practice nursing students. She also collaborated with colleagues to improve the reproductive health of women in Russia. Through the five-year Balashikha Project collaboration, Kelley worked with the Future of Russia Foundation, the World Health Organization/Collaborating Center, the Centers for Disease Control and Prevention, and Emory’s School of Medicine, to create a perinatal center within a hospital just outside of Moscow in Balashikh. The team transformed the hospital into a referral center for high-risk mothers and babies in the Moscow region, and begun to develop a perinatal surveillance system. Kelley was instrumental in customizing the partogram [a graphic recording system] to monitor the status of the mother and fetus during labor. She also advocated for greater emphasis on family-centered maternity care and prenatal education. Kelly has received many honors and recognitions for her contributions. She is a fellow of the American Academy of Nursing and the American College of Nurse-Midwives. In 2006, she received the Health Care Heroes Award in Allied Health from the Atlanta Business Chronicle. She was also one of the first School of Nursing participants in Emory’s Woodruff Leadership Academy. The School of Nursing will celebrate Kelley’s illustrious career during a private reception in December.